TAKING NOTE: HOW MANY NOTES DO HOSPITALISTS LOOK AT WHEN WRITING H&PS? Meeting: Hospital Medicine 2018; April 8-11; Orlando, Fla.
Background: Recent widespread adoption of electronic health records (EHRs) has dramatically increased the amount of information quickly accessible to clinicians. Given recent pushes for interoperability and consumer generated data in EHRs, the volume of information will continue to grow. The result is clinicians who experience information overload and lack the time and ability to comprehensively review all potentially relevant information available to them. A novel strategy to address this problem is to use EHR audit log data to observe clinician information-seeking patterns in the EHR, which can guide future efforts to improve EHR design. Of particular interest is how much of the EHR physicians access when developing their initial clinical assessment. The objective of this study was to describe the number of prior-to-admission (PTA) notes viewed by physicians before signing an admission history and physical (H&P) note on a hospitalized patient. Methods: This study was conducted at an 800-bed academic teaching hospital. Data were obtained from Epic EHR user access logs that are automatically generated for auditing purposes. We identified all admission H&P notes entered on patients admitted to the hospital medicine service over a 6 month period (4/1/2017 to 9/30/2017) and counted the total number of PTA notes, a sum of the number of all prior-to-admission notes written by clinicians available in the EHR. This sum included hospital admission notes, progress notes and discharge summaries as well as outpatient and consultant notes. We then determined the number of unique PTA notes accessed by the authoring physician when writing the admission H&P, from 24 hours before creation of the note until the time the note was signed and closed. Results: We identified a total of 4,318 hospital admission H&Ps over the 6 month time period. On average, patients had a mean 147 [range 0-1984] PTA notes available in the EHR at the time of their admission. Physicians on average viewed 5.73 PTA notes [range 0-50] when writing their admission H&Ps, 3.9% of available notes. Historical H&Ps (18.8%) and discharge summaries (19.9%) were viewed more often than progress notes (5.5%). 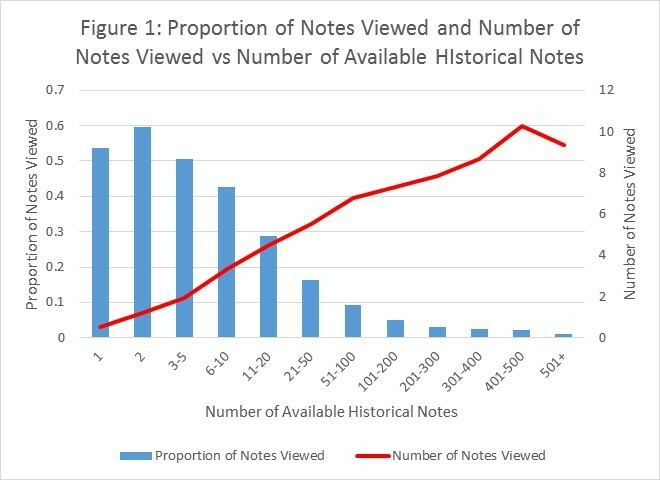 H&P authors read more notes as the number of available notes increased (Figure 1). However, this corresponded with a smaller proportion of available notes (Figure 1). Conclusions: It is striking that only 3.9% of available notes were reviewed by admitting physicians when writing the H&P. As the amount of data available to clinicians exponentially rises, the ability of individual clinicians to comprehensively review and interpret all relevant data diminishes. These results help guide efforts to create tools that augment a clinician’s ability to process large amounts of electronic data. At the same time, they raise the question of whether a novel approach to reducing documentation review burden could be empirically guided by what types of information clinicians most routinely use. Wang, MD; Adler-Milstein, J. TAKING NOTE: HOW MANY NOTES DO HOSPITALISTS LOOK AT WHEN WRITING H&PS?. Abstract published at Hospital Medicine 2018; April 8-11; Orlando, Fla. Abstract Top 15 Research & Innovations. https://www.shmabstracts.com/abstract/taking-note-how-many-notes-do-hospitalists-look-at-when-writing-hps/. Accessed April 22, 2019. « Back to Hospital Medicine 2018; April 8-11; Orlando, Fla. Copyright © 2014-2018 Society of Hospital Medicine or related companies. All Rights Reserved.